Sweatpants & TV | The Vampire Diaries, 7x03 – "Age of Innocence"
This week, three years in the future again, Stefan is now in contact with Tyler Lockwood asking if he has heard from Caroline. Though you’d think Stefan would likely call this mysterious fiancé next, it seems maybe Tyler is not the lucky man after all. He tells Stefan that he hasn’t heard from her and won’t be talking to her if it means getting between the two of them an their drama. Ouch! 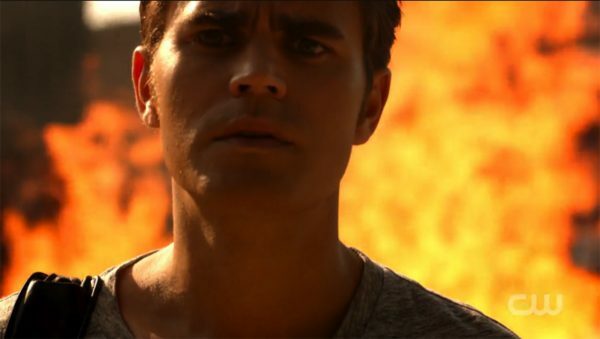 Stefan begs him to warn Caroline and they both agree that he needs to get gone… fast! He sets his pretty car ablaze, and he’s off. Caroline is still stuck in Mean-Girl Mansion, spelled into Stefan’s old room, and being pranked on by Nora and Mary Louise. Her only distraction is Valerie’s prison world copy of Stefan’s journal that seems to raise more questions than it answers about the relationship he had with Valerie. She is all too willing to share though, especially if it means putting a wedge between Caroline and Stefan. Oops. Momma Salvatore can’t drive. Stefan finds her practicing her parallel parking, just inches from putting a good dent into his car. 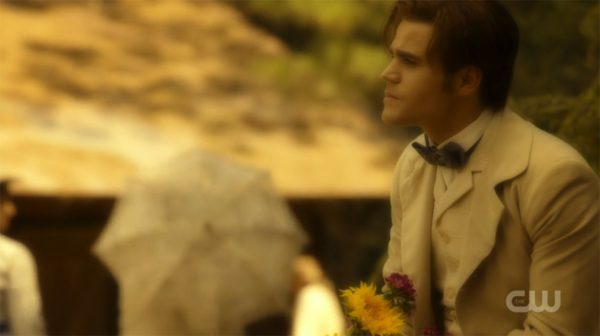 Stefan is quick to explain that his car is off limits, especially given the current destruction of his life at her hand. This shows just how bad things are in a future where he can torch and abandon his precious Porsche without a second thought. Oh, how the mighty have fallen. Stefan is presented with the perfect opportunity to appeal to Lily and get some much-needed information along the way when he takes her for a little driving lesson. As it turns out, Lily sent a still human Valerie to check on her young son before she took off across the world with her new bad boy “gentleman friend,” Julian. Little did Lily know that Valerie did a lot more than just watch Stefan. As Valerie tells it, she was the first love of his life (and also that other first, if you get my drift). Caroline gets it now. The little skin-to-vervain trick wasn’t to keep Nora and Mary Louise from touching her; it was to keep Stefan from being able to. Sneaky! Though they only had one day with each other after Julian drags Valerie away, she promises to find him again and tells Lily (at Julian’s “persuasion”) that her son is happy even though he was clearly still mourning the loss of his mother. She sent word via telegram, and he believed that she was coming back for him as promised. He waited on her all day before realizing that he had been abandoned once again. Poor Stefan. Caroline is equally heartbroken for him as Valerie, disliking her judgment, refuses to tell her anymore of the story. Meanwhile, new roomies Damon and Rick with tagalong Bon Bon are on the hunt for a missing heretic. Bonnie is still plagued with visions caused by the phoenix stone. The one that Rick only told her he destroyed. Luckily they are about to perform a ‘good old-fashioned hostage swap’ with someone who can syphon magic. They find our missing member of Lily’s family living it up in Myrtle Beach enjoying his freedom from the orphanage back at the Salvatore house. He agrees to get rid of Bonnie’s visions in exchange for their silence about his whereabouts. Unsurprisingly, Orphan Oscar recognizes these visions and takes off with the stone, leaving Rick and Bonnie to duke it out over Rick’s lie. Lily returns to Caroline after Stefan has spent the day softening her up, and she eventually decides to let her go, but not before Caroline explains that Stefan loved and missed her. It’s all in his journals for Lily to read for herself. Caroline is free, and she and Stefan on well on their way to moving forward with their new relationship (if only they could get rid of this pesky no-touching problem). Oscar may think he has fallen at the hands of Damon, but it’s Valerie who finds him and takes him out herself after learning that the errand he was on was to find none other than our new big bad, Julian. It would seem Valerie has every reason to not want Julian back among the family. Valerie’s story is heartbreaking. She was sent on an errand only to fall for the boy she was supposed to watch. Then she left him believing she had abandoned him. 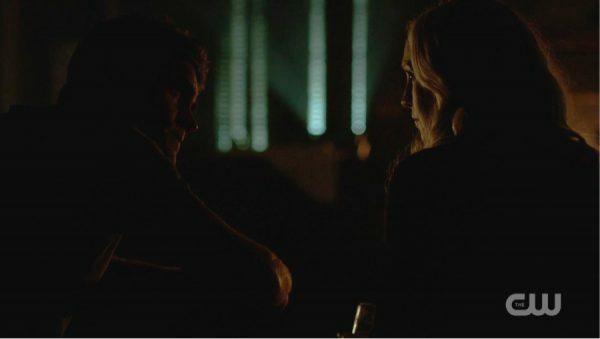 Neither Caroline nor Stefan get to see the real backstory, and just when you think he is going to, we realize that Valerie has cloaked herself from him during her whole confession of events. She carries this alone. Will she ever tell Stefan what happened? Will he ever ask? Julian is a bad, bad man! What happened to him all those years ago to split him from the rest of the family? We still don’t know who this scary entity is that they are all running from in the future or how connected it is to the heretics. We do know that whoever it is knows of the Phoenix Stone, and as Rick is determined to use it, with or without Bonnie’s help we are sure to soon find out the connection. Katie is a 30 year old consumer of pop culture in all of its various forms. From music to television to books and movies, the word FAN is putting it lightly. It all started with a little TV show (you might have heard of it..) called “Buffy the Vampire Slayer” and the rest is a long growing history of geekdom and nerdism. There are an average of a dozen or more new episodes to watch on the DVR each week (favorites being Grey’s Anatomy, Supernatural, & The Vampire Diaries) and she reads 4-5 books a month all while being a new wife and stepmom of two preteen boys. Though she has been an aspiring novelist since the age of 6, she works a boring 9 to 5 day job in advertising. The Vampire Diaries "Age of Innocence"